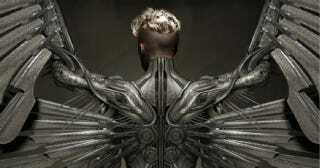 Bryan Singer has been teasing the return of Angel to the X-Men world for sometime, but today it's official. Angel's back, and he's got a brand-new look — but it's one that should be very familiar to comics fans. Comics fans will likely recognize these as the metal wings of Archangel, the moniker Angel took when he joined forces with the evil mutant Apocalypse. Angel's original wings had been destroyed, and he was so despondent he agreed to serve as Apocalypse's Horseman of Death in exchange for these replacements. It seems a pretty safe guess Angel will be making a similar deal in the Apocalypse movie. You can check out more images of Angel's new wings over at Empire.